The jailing of 10 activists by Burma’s government was slammed by regional human rights groups who accused the government of muscling out local villagers in favor of multinational development projects. The Asian Forum for Human Rights and Development (FORUM-ASIA), that represents 47 member organizations from 16 nations across Asia, has criticized Burma’s decision to throw 10 rights activists in prison. The activists were protesting against the Shwe Gas Project in Arakan State. The Chinese-backed Shwe Gas Project is one of Burma’s largest extractive industry sites, transporting natural gas and crude oil to southwest China. 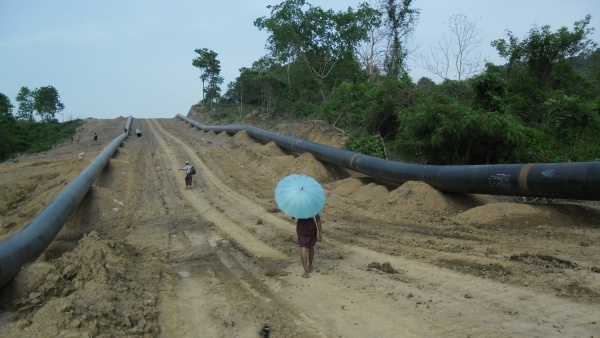 The pipeline project “passes through twenty townships across Burma and has thus far resulted in a long list of human rights abuses, including forced labour, forced eviction and land confiscation, and arbitrary taxation,” FORUM-ASIA said in a statement to the media. “The case of the Shwe Gas Project highlights the numerous human rights violations that have been caused by business activities, often with the complicity of the government, which has become endemic in Burma,” said Evelyn Serrano, FORUM-ASIA’s Executive Director, in a statement to the press. On April 18, 400 villagers marched to the office of the China National Petroleum Corporation, demanding the project be stopped. The ten were detained and subsequently charged and convicting for violatin Article 18 of the Peaceful Assembly and Peaceful Procession Law, which requires a permit to be obtained by the authorities for any public assembly, FORUM-ASIA said in a press statement. The villagers had previously been denied a permit twice – in December 2012 and in March 2013 – on the purported grounds that a state of emergency had been declared under Article 144 of the Penal Code following ethno-religious clashes in other parts of Arakan State, despite the fact that there had been no incidence of violence in Maday Island, FORUM-ASIA added. “The Peaceful Assembly and Peaceful Procession Law and the Penal Code, two laws that are increasingly being selectively used by the Burma government to criminalize the legitimate work of human rights defenders, clearly contain numerous restrictive provisions that contravene international human rights norms and standards.” Serrano said. FORUM-ASIA said it had highlighted the case of the ten Shwe Gas Protestors to the UN Human Rights Council in May and September. “We are deeply concerned about the emerging trend of criminalization of human rights defenders working on issues relating to land disputes caused by business activities in Burma, and this has been underscored by the latest conviction of the ten Shwe Gas protestors under the highly restrictive Peaceful Assembly and Peaceful Procession Law,” said Serrano. The arrests mark another chapter in Burma’s use of law as a punitive means against anti-development protests. Previously, on 29 August 2013, woman human rights defender Naw Ohn Hla was sentenced to two years’ imprisonment under Article 505(b) of the Penal Code, for breaking the same law when protesting against the Letpadaung copper mine project alongside local villagers. Again, in July, Ko Aung Soe was sentenced to 11 years and a half years in prison after being detained incommunicado, also in relation to protests against the Letpadaung copper mine project. “The Burma government must immediately initiate a process to repeal all restrictive provisions in these two laws, and release all individuals detained and imprisoned under these laws, in line with its pledge to free all political prisoners,” Serrano added. The arrests came in spite of the pledge made by President Thein Sein to free all political prisoners in the country by the end of 2013 in a visit to London in July where he met British Prime Minister David Cameron.